Kyle Grillot - kgrillot@shawmedia.com Jacobs senior Ryan Weibert celebrates after a touchdown in the fourth quarter of the high school football game against Cary-Grove Friday October 11, 2013. 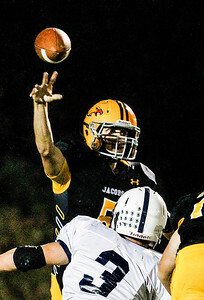 Jacobs won the game 36-35. Kyle Grillot - kgrillot@shawmedia.com Jacobs junior Nick Gierlak celebrates after running the ball for a first down win the fourth quarter of the high school football game against Cary-Grove Friday October 11, 2013. Jacobs won the game 36-35. Kyle Grillot - kgrillot@shawmedia.com Senior Bret Mooney outruns the Cary-Grove defense during the fourth quarter of the high school football game against Cary-Grove Friday October 11, 2013. 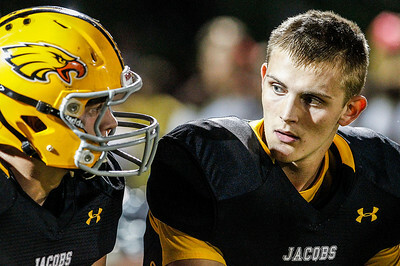 Jacobs won the game 36-35. Kyle Grillot - kgrillot@shawmedia.com Jacobs senior Bret Mooney completes a pass to junior Josh Walker during the first quarter of the high school football game against Cary-Grove Friday October 11, 2013. Jacobs won the game 36-35. 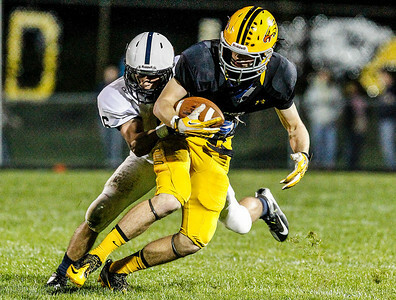 Kyle Grillot - kgrillot@shawmedia.com Jacobs junior Camden McLain is tackled by Cary-Grove senior Kevin Fisher during the second quarter of the high school football game against Cary-Grove Friday October 11, 2013. 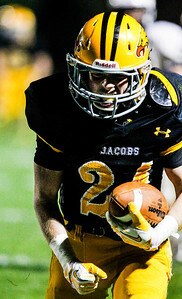 Jacobs won the game 36-35. 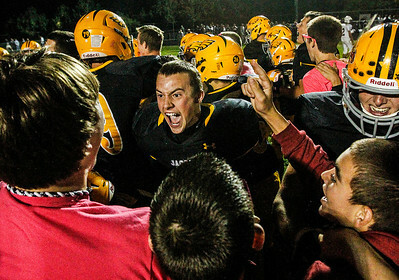 Kyle Grillot - kgrillot@shawmedia.com Jacobs fans rush the field to celebrate with football players after their win against Cary-Grove Friday October 11, 2013. Jacobs won the game 36-35. 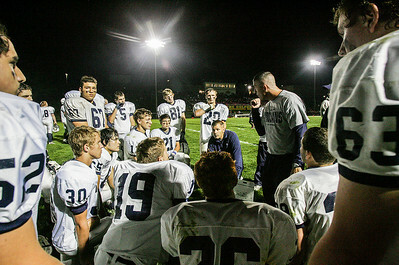 Kyle Grillot - kgrillot@shawmedia.com Cary-Grove head coach Brad Seaburg talks with his team during half time of the high school football game against Jacobs Friday October 11, 2013. Jacobs won the game 36-35. 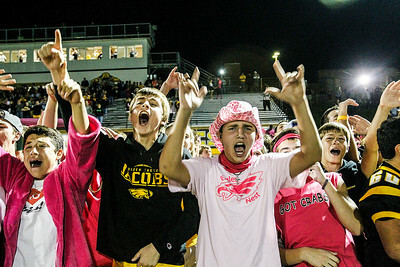 Kyle Grillot - kgrillot@shawmedia.com Fans wait to rush the field during the final seconds of the fourth quarter of the high school football game against Cary-Grove Friday October 11, 2013. Jacobs won the game 36-35. Kyle Grillot - kgrillot@shawmedia.com Senior Bret Mooney talks with senior Hunter Williams quarter of the high school football game against Cary-Grove Friday October 11, 2013. Jacobs won the game 36-35. 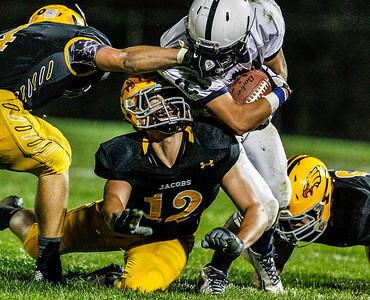 Kyle Grillot - kgrillot@shawmedia.com Jacobs sophomore Brenden Heiss (12) gets pinned between senior Tommy Savage's tackle on Cary-Grove junior Zach McQuade during the third quarter of the high school football game against Cary-Grove Friday October 11, 2013. Jacobs won the game 36-35. Kyle Grillot - kgrillot@shawmedia.com Jacobs junior Nick Gierlak celebrates after running the ball in for a touchdown during the fourth quarter of the high school football game against Cary-Grove Friday October 11, 2013. Jacobs won the game 36-35. 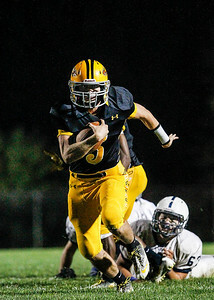 Senior Bret Mooney outruns the Cary-Grove defense during the fourth quarter of the high school football game against Cary-Grove Friday October 11, 2013. 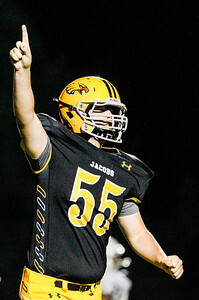 Jacobs won the game 36-35.